A lovingly restored, historic 4 BR country home sits on 160 acres of private land in the Northwoods of Presque Isle. The White House, a lovingly restored, historic 4 BR country home sits on 160 acres of private land in the Northwoods of Presque Isle. 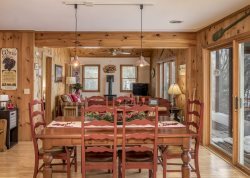 The updated vintage interior has old-fashioned charm with modern conveniences, and the view from the kitchen of a scenic pond abundant with wildlife will make your morning coffee extra enjoyable. Be sure to have your camera ready to capture one of the spectacular sunsets. This bright cottage is ideal for reunions, retreats, girls’ getaways, and fun yet relaxing vacations. The basement "man cave" is sure to please one and all. This home is ideal for reunions, retreats, restorative getaways, and fun yet relaxing vacations. Bird watchers, writers, snow shoers, canoers…you will love this property! The pond provides excellent opportunities for wildlife spotting and sunset gazing, but if it’s fishing or swimming you're after you will want to try some of the local lakes. The otter, beaver and waterfowl take most of what’s available. The White House is only a few miles from public boat landings and bike trails. We welcome conscientious snowmobilers as this house is very close to trail #6. Michigan’s Upper Peninsula is just over 30 minutes away, providing hiking, waterfall viewing, the majesty of Lake Superior, and the Midwest’s best downhill skiing. During peak season enjoy a Saturday-Saturday stay. Off-peak season there is a 3-night minimum. This home is beautiful, with a combination of old charm and new amenities. It was the perfect place for a group of us to hang out, cook, and be cozy in the evenings for our cross country skiing trip. The Northwoods Home Rentals group is fantastic - very responsive and helpful, and solid email communications every step of the way. Well definitely use them again! The White House was the perfect historic cottage, with many vintage details and beautiful decorating, super cozy but modern amenities. We were there in early December, so cannot really judge the lake and outdoor amenities, but the views from every window were gorgeous! There is also a new sauna with a view of the lake - heaven! We loved everything, it was enchanting! Great place, meets all expectation.We reserved this place to relax and enjoy the great Northwoods and that is what we all experienced. Thank you for providing such great accommodation. Kayak was simply the cherry on top! Great response rate and responsive to all questions asked! Excellent, as always. Because this is the most amazing rental property we've ever stayed in (well, maybe tied with one in the south of France, but let's not get picky)! The White House has everything you could imagine to enjoy a relaxing vacation in the northwoods. It's so quiet and peaceful--even when the trumpeter swans are playing their jazz! This place is heaven. We love honest input! If this was your home, what changes would you make? Oh dear. I think I would change the seating arrangements in the living/dining space so that there were better talking arrangements for those not at the dining room table. BUT THIS IS SO NIT-PICKY and everyone is so comfortable here, I'm really stretching to find something! Worked with Becky, she was awesome and very helpful! Beautifully updated Farmhouse with all of the modern amenities and more. Not your typical Northwoods Cabin, but the house is very well done. Tell us about your favorite feature of the property. Sauna in the basement, and the pool table and dartboard....What additional services or vacation property features would have added to your overall experience? We were snowmobiling, so having a garage on site would have been a huge added bonus. Beautiful house with wonderful views and surrounding landscape. Prompt response from Owner was appreciated. Tell us about your favorite feature of the property... The setting. Lots of birds, wildlife What activities did you participate in while visiting? (ex. shopping, spa, golf)...Canoeing, bicycling, dining. We loved it and hope to be able to go back sometime in the near future. Julie has been wonderful to work with. Usually very quick to reply, friendly on the phone, and gets things done. We hope to come back next year! It feels like home after two summers. We enjoy the history and the unobtrusive decorating, not too much cute northwoodsy stuff, just real, carefully selected and arranged dcor. Our family LOVED the house: the kitchen (it had more than everything we needed to cook great breakfasts! ), the sauna, the lakefront view, the fire pit, the overall comfiness. We had such a great stay! We had a nice time and would consider a return in the future. It would be nice to have known a little more about the lake the house was situated on. We spent some time fishing without success. We did have some luck at another nearby lake. Thank you for letting us rent your property. We are absolutely in love with the White House! We absolutely loved this property! Magnificent views! Night sky was amazing!Perfect pond if only there were less aquatic plants......Tell us about your favorite feature of the property.Mom says kitchen. Kids say basement! Also the peacefulness of the location..	What activities did you participate in while visiting? Visited Michigan, hiked and biked in area. Man. Waters flea Market, Mercer shopping, beach in Man. Waters.. Thank you for the wonderful Review: I thought I would let the home owner respond-- We are so pleased that your family fell under the spell of The White House. The house and the surrounding 160 (4/40s) acre parcel have been enjoyed now by five generations of our family. Like your 4 year-old, our kids who are now in college, grew up spending their summers at The White House, as did my generation, visiting Grandpa and Grandma. I am happy to say that some of their original furnishings still occupy the house, though we have worked hard to update it and still maintain the 1907 Farmhouse feel. We love sharing this family treasure with others and do hope that you and yours will continue to make the home part of your family history. We will be working on walking trails around the little lake this fall and spring something to look forward to. Sincerely, the White House Family! I hesitate to write this review only because I worry that we won't be able to stay at this beautiful house when word gets out at how amazing it is. That said, I can't contain my happiness that we were allowed a week in this piece of paradise. My family and I have been coming up to Presque Isle for a week in the summer for the past thirty years (since I was eleven years old). We have rented at a number of places, but this was our first year in the White House. When I found it online, I worried that my husband would be a little disappointed that he couldn't do much fishing in the pond. When we got there, though, we quickly realized that the beauty of the pond more than made up for the lack of fishing. The privacy and quiet are amazing. And the swans, the heron, the otter and the eagle kept us oohing and ahhing. Plus, he just went over to the big lake when he wanted to fish. The house itself is gorgeous. It is perfectly outfitted and I really never wanted to leave. From the screen porch the beautiful dining room looking over the pond to the gorgeously executed kitchen to the useful mudroom ... Ah, and don't get me started on the bedrooms with their ceiling fans and great big, double-hung windows allowing for sweet night breezes. My family rents other houses in the area during the same week and we gather for dinner at each others' houses each night. No one could stop talking about how wonderful the White House is and I think everyone was trying to plot how they could nab it for next year! Please, please let us keep renting this house for years to come! I really get a little emotional when I think about how our four-year old daughter may be able to grow up getting to come to this beautiful space once a year. Thank you so much for choosing to stay with Northwoods Home Rentals! The homeowner and I greatly appreciate your business and feedback. We strive to provide our guests with the highest level of satisfaction, and are always looking for ways to improve our service. The homeowner and I hope that your trip to the Northwoods was filled with great memories. We hope to see you again soon! We had a lovely stay. The house was well appointed and comfortable. The swans gave us a lovely visit each morning. The first floor bedroom and bath is great for seniors. Autumn is a great time to be in the Northwoods. The tamaracks on the pond turn blazing yellow and the young swans learn to fly. This was a perfect place to stay to relax and yet do some biking and nature walking! We enjoyed watching the wildlife in the morning while having coffee. They have swans on the wetlands just outside the house! There are ducks,geese, and we saw a blue heron! There are bike trails nearby in adjoining towns and if you want a day trip,Lake Superior is just over an hour away! The beds were comfortable. Everything was so clean and organized. We will come again, I hear the fall is a must see time here! Such a homey feeling at this house. Love the old charm with the modern conveniences. And, love watching the wildlife! This home is a real jewel! Thanks for sharing it! I first stayed at the "White House" as a child in the 1950's. The house has been fully renovated since then. The peace and quiet combined with the wind rustling through the pine trees make this a place for total relaxation. The wildlife is endless. At night the milky way is clearly visible for excellent star gazing. Are you a romantic? Then this is the place for you. I particularly enjoy watching the sunset over the private lake while sipping on a cocktail or a fine wine. I have been reading Country Living Magazine for a long time. Staying in the White House was like living in the pages of that magazine. It was charming, relaxing, beautiful and functional. The area has a lot to offer if you are into anything outdoorsy and I really enjoyed taking my morning coffee in the canoe while checking out the wildlife on the private pond. The bedrooms are comfortable, there's lots of nice hot water for showers and baths and the kitchen is fully stocked if you want to cook. Loved, loved, loved our stay. Beautiful house & beautiful area. It was a great experience and we thank you for pulling through on short notice. Thanks again and God Bless. Go Badgers! Thank you for your fantastic review of our family home. It is so nice to see that 25 years of restoration is bringing peace and joy to others. Come back and visit any time. The swans are incredible to watch. Ive seen them hatch and fledge! The place was absolutely incredible! Walked in and we were just amazed. The home has beautiful wooden floors, very comfortable settings and a gorgeous view. There is 1 bedroom downstairs. A full bath and a wonderful screened in porch. The upstairs had 2 bedrooms with king size beds that were very comfortable and 1 bedroom with twins. The upstairs bathroom was very spacious with a small shower. Being a foodie and an ex-chef, the kitchen was what I needed to enjoy and help me relax, but was able to barbecue a couple of times while watching a breathtaking sunset. The Bear Restaurant is a stones throw away for one of the best Supper Clubs around. Seeing a pair of swans and their little one was a pleasure every day and they seemed to enjoy us, since they came up to visit on a regular basis. There are ducks, hummingbirds, wild turkeys and even loons flying overhead from time to time. There is wireless internet & satellite TV, but who needs it, it takes away from the peaceful surroundings. We will definitely be returning and would highly recommend to everyone.